It’s easy to feel disconnected from nature during the colder months of the year. Spending time in the garden is less ideal thanks to low temperatures and a lack of plant growth. The cold and extreme weather may encourage you to hibernate indoor, but you can reduce symptoms of cabin fever by bringing the outdoors in. 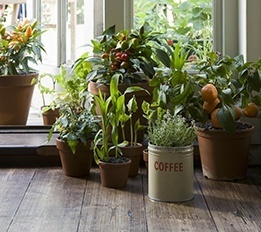 Houseplants brighten up a living space during the winter and purify the air around them. Surrounding yourself with indoor plants is known to reduce stress as well. Aloe doesn’t just heal; it also makes for a terrific houseplant. It’s wise to have aloe around, as it can be used to treat burns and scrapes. Concerned about the pollutants in the air caused by household cleaning products? An aloe plant can take care of these toxins. The plant will actually indicate when it—and you—are being exposed to too many pollutants. Look for brown spots on the plant’s leaves. Other than needing a lot of sun, aloe is fairly self-sufficient. You don’t need to water it very often; wait for the soil to dry completely before quenching its thirst. Given its beautiful display of fronds, the Boston fern is a classic houseplant for a reason. Ferns aren’t just aesthetically pleasing; like a humidifier, a fern is capable of replacing pollutants in the air with water vapor. Place this plant in a room where the temperature can be kept at a level between 60° and 70° Fahrenheit. Ferns need to be exposed to moderate indirect light, as well as ample moisture. Mist and water these plants often, keeping their soil damp at all times. A fern will let you know if it gets too hot or thirsty; watch out for yellowing leaves. Enjoy small red flowers year-round by taking home a crown of thorns plant. Place this popular houseplant in a sunny spot that receives indirect light. The roots should stay moist—as opposed to wet—and watering is only necessary once the soil dries out. Be advised that this isn’t the best plant to leave out in front of children. As its name suggests, this plant bears thorns. Furthermore, its stems produce a substance when cut, and this milky latex can cause rashes and blisters on skin. To be safe, mount your pot of crown of thorns to prevent anyone from touching them. Spider plants are very common houseplants. Known for their texture and dimension, they sprout long, narrow leaves. This is one of the many useful houseplants that can detoxify the air in your home. Unhealthy spider plants start to develop brown spots on their leaves, however. You can prevent this from happening by hydrating them with distilled water. Cacti and succulents make great houseplants. Get the best of both worlds by displaying a zebra cactus. Technically a succulent, this plant is as hardy as a cactus. These small plants make a big impact; their large green leaves develop spiraling white ridges that resemble animal print. Put your zebra cactus next to a south-facing window so that it gets a daily dose of bright, indirect sun. This “cactus” does need water once in a while, but only after its pot has dried out completely.